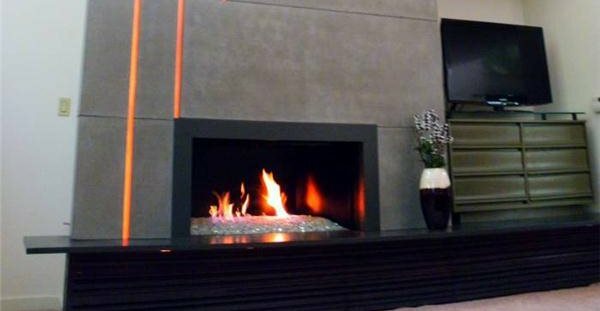 Seven panels of concrete, stacked from floor to ceiling, create this 20-foot-tall fireplace surround. The fireplace hearth is integrally colored black concrete containing pieces of crushed glass, revealed by polishing. Frosted glass channels in the fireplace accentuate its height and are backlit to augment the flames. M Concrete Studios likes to come up with creative solutions for their clients' design challenges. 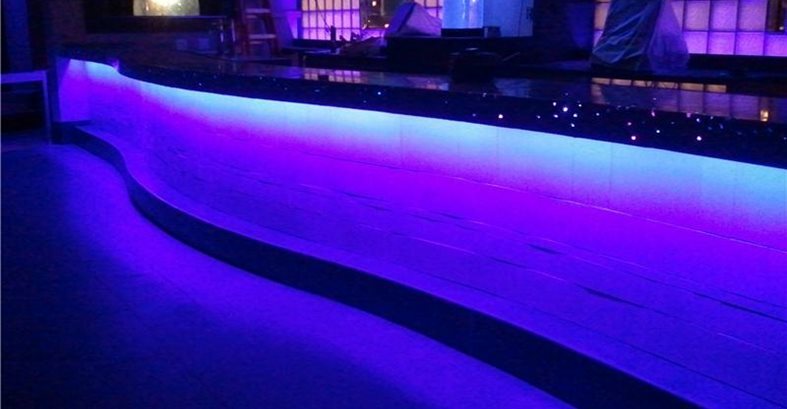 Another recent project reflecting their design ingenuity is this curved bar with a concrete top. "The bartop is a glass grind with fiber-optic cables attached to the glass pieces," says Mehaffie. The face of the bar is white concrete tile. The bar step at the base is also concrete. The challengeHomeowners Tom and Jean Graves of Bellbrook, Ohio, wanted a massive fireplace for their great room that would take advantage of the high ceilings and complement their modern artwork and décor. "The height of the fireplace and mass of the project were our biggest challenges," says Zack Mehaffie of M Concrete Studios, a firm that specializes in custom concrete fireplaces, mantles, and countertops. Design goalsThe fireplace is made up of seven layers of nearly 2-inch-thick, 7-foot-wide gray concrete slabs that wrap the edges on both sides. "Our first goal was to play on the height of the piece. We were able to accent the height using three channels of backlit, frosted glass vertically cutting the slabs," says Mehaffie. "We also wanted to create very clean, cool lines and use cool colors to fit a modern home." For dramatic effect, the glass channels are backlit when the fireplace is in use. The concrete slabs, which were precast in M Concrete Studio's shop and assembled onsite, are reinforced with ½-inch steel and fiber reinforcement. They are attached to an intricate framing system of 20-foot 2x10 lumber and custom steel. Behind the concrete panels is a steel hearth that wraps a custom firebox. Because of the weight of the piece (each concrete slab weighs 400 pounds), the floor underneath is reinforced with four 2×12-inch laminated-veneer lumber (LVL) beams to prevent any sagging. 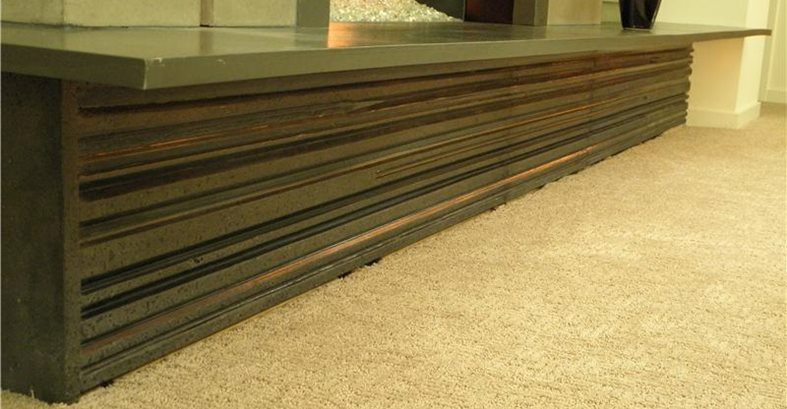 Accenting the base of the fireplace is a custom black-colored concrete hearth containing crushed glass, ground to a high polish.